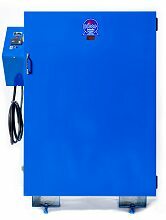 The Keen K-1000 is an electrical industrial oven that is designed for heated storage of low-hydrogen, shielded metal arc welding (SMAW) electrodes in order to maintain factory-fresh dryness in the hygroscopic flux coating. It has a 1500 lb. storage capacity and a temperature range of Ambient-550°F (Ambient-288°C). To prevent atmospheric moisture absorption in the low-hydrogen flux coating of SMAW welding electrodes, the Keen K-1000 welding electrode oven is your answer. Highly efficient and easy to use, it is the ideal solution for heated, dry storage of up to 1500 lbs of SMAW electrodes with lengths up to 18 inches (45.7cm). As with all Keen ovens, the Keen K-1000 welding rod oven can be customized to suit other applications. We can modify the temperature range, size, shelving configuration and more. Please contact us with your requirement today 1-888-512-2870. Please click here to see customized versions of the K-1000. How are K-1000 welding rod ovens used in the field? As explained above, SMAW rod ovens for holding are designed to reach temperatures needed to maintain dryness and prevent atmospheric moisture absorption in the flux coating of low hydrogen SMAW electrodes. The large capacity rod ovens are often centrally located within a facility where the storage and distribution of welding consumables is controlled. When electrodes are returned from the field, they are examined, and it is determined if they are to be put into a holding rod oven or redried at high temperatures in a rebake rod oven. Keen K-1000 holding SMAW rod ovens are large capacity units, and are the preferred choice for many large manufacturing, fabrication and aerospace facilities where tight control of welding electrode quality and cost is of utmost importance. What can you tell me about performance of Keen K-1000 rod ovens? The K-1000 is ruggedly designed to withstand years of use in the most demanding industrial environments. Heavy-gauge steel is used throughout the unit and 2 inches of mineral wool in the oven walls and door keeps Keen K-1000 SMAW rod ovens well-insulated and energy efficient. The exterior features a durable powder-coated paint that is highly-resistant to industrial environments and will stand up to years of use. Thorough, energy-efficient and quick heating is the hallmark of all Keen welding electrode storage ovens. The K-1000 holding rod oven in particular has three 1000W incoloy sheath tubular heating elements placed in areas to facilitate natural convection and efficient heating. As standard equipment, Keen K-1000 rod ovens feature a microprocessor-based ON/OFF controller with digital temperature adjustment and LED temperature-indicating display. The temperature reading can be displayed in either Fahrenheit or Celsius, and has a ±1 degree accuracy. Handy tactile increment/decrement keys on the controller’s water-resistant front panel enable easy temperature set point adjustment. The controller also features an on/off control mode. The standard control unit supplied with Keen K-1000 rod ovens is programmable for standard operation, and upgraded temperature controls and accessories are available. 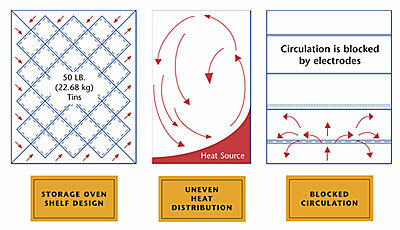 Please visit our temperature control page to learn more by clicking here. 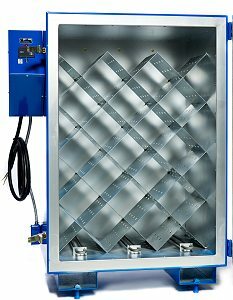 Can you explain the purpose of angled shelves in the K-1000 stick welding rod ovens? I would like a different shelving configuration. Can Keen offer a different type of shelf system for Keen K-1000 welding rod ovens?